Last Friday, March 14th, a crew working for the City of Charleston’s Parks Department encountered some curious brickwork while digging a trench behind the Hazel Parker Playground on East Bay Street. 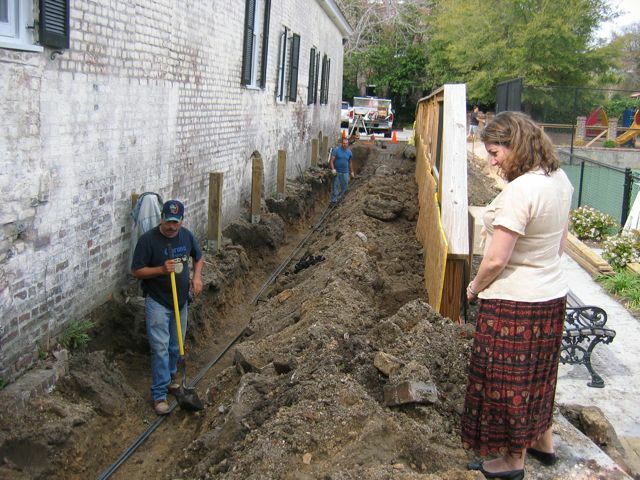 Rather than shrugging their collective shoulders and continuing with their work, Project Manager Bill Turner picked up the telephone and called archaeologist Martha Zierden of the Charleston Museum to ask her opinion of the brickwork. Martha was working in the field beyond Charleston, however, as was archaeologist Eric Poplin of Brockington and Associates. Martha managed to contact me and Katherine Saunders, co-chair of the Walled City Task Force, and she and I met at the playground, just one block south of the recent archaeological dig at South Adger’s Wharf. The entrance to the Hazel Parker Playground is through a rectangular one-story brick building at 70 East Bay Street, behind which are outdoor facilities for tennis, basketball, and baseball. The brick building dates from the early years of the twentieth century, and is built on the site of a slightly larger three-story commercial structure that stood for most of the nineteenth century. An image of that building, from the 1884 Sanborn Insurance Map of Charleston, is seen above left. The 1902 edition of the Sanborn map of Charleston shows only “ruins” of this building, as seen here to the right. A work crew had recently cut a trench along the back wall of 70 East Bay Street in order to build brick buttresses to strengthen the east side of the building. In the trench they discovered a continuous line of brickwork running parallel to and about three feet east of the existing building. The western edge of this brickwork was visible in the trench (see the photo to the right below), but the eastern edge was buried below the mound of earth removed from the trench. 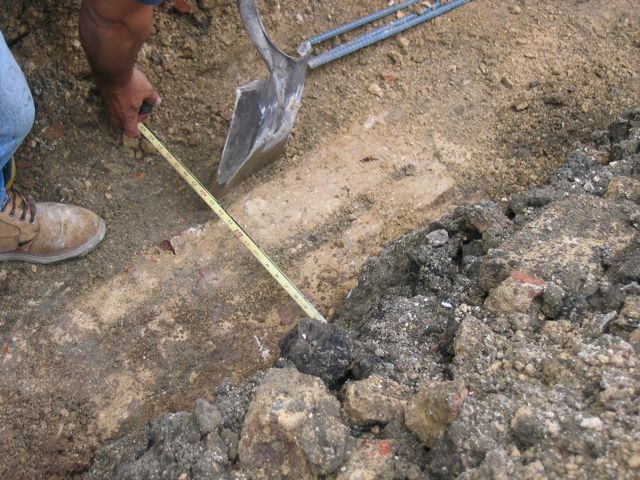 The exposed portion of brick was approximately two feet wide, but the full width of the wall could not be determined. At any rate, Katherine and I concluded that this brickwork most likely represents the foundation of the eastern wall of the nineteenth century commercial offices that once stood in front of the cotton warehouses and wharves of the Commercial Cotton Company. While this brick foundation wall runs parallel to the old “curtain line” of the colonial fortifications along the east side of East Bay Street, it’s located more than thirty feet east of that historic wall. Our site visit last Friday didn’t turn out to be associated with the “walled city,” but we greatly appreciate the spirit of cooperation that inspired Mr. Turner to share this discovery with the Task Force. We look forward to many more such opportunities to share in the process of uncovering Charleston’s past.